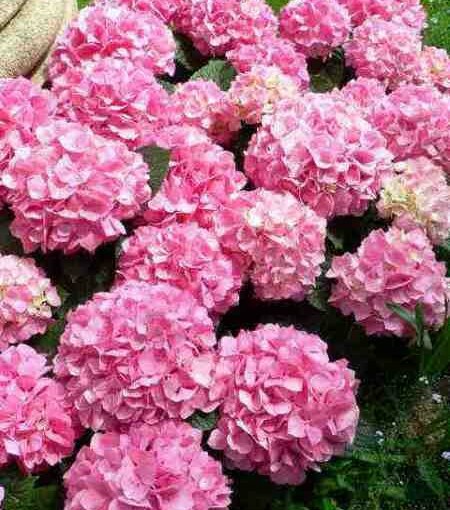 Hydrangea macrophyllas have two distinct forms to their blooms. The one most often encountered in gardens is the mophead or hortensia hydrangea, which has a mass of coloured sterile florets that form a round head. Mediterranean Gardening: A Waterwise Approach. The true hydrangea flowers are seen clearly in the other bloom type – the lacecap. These have a cluster of small, fertile flowers in the centre surrounded by a ring of large, coloured, sterile florets. Hydrangea is the spectacular flowering star of the summer and autumn garden, and established plants are able to withstand dry periods surprisingly well, as long as they get a good drink regularly during the hot season. 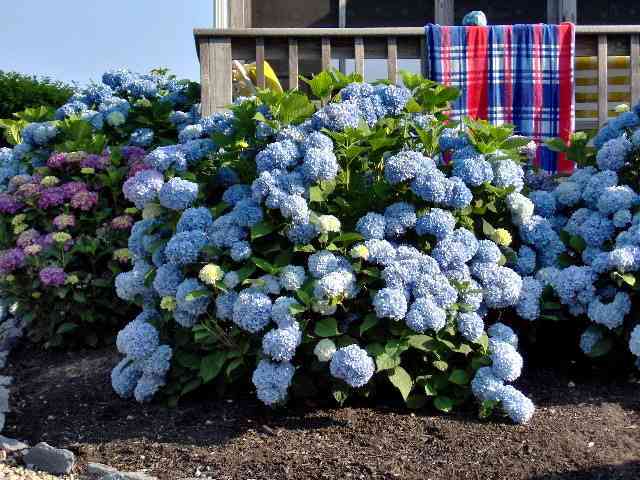 Interestingly, hydrangeas also seem to grow to perfection in coastal areas and can even withstand a few salt-laden sea breezes. They are not particular about soil conditions and seem to grow just as well in heavy clay soils as they do in sandy loams. The hydrangea most commonly grown is the large-leafed Hydrangea macrophylla, which grows in a multi-stemmed, tight dome of foliage and flowers. When planted fairly closely together, these plants produce a dense canopy of shade, right down to soil level, which makes them superb, weed-suppressing, ground-covering plants. And they look fantastic through most of summer. Hydrangea macrophyllas have two distinct forms to their blooms. 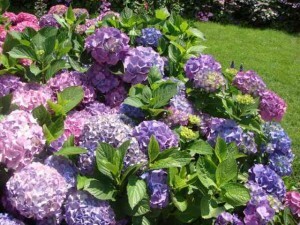 The one most often encountered in gardens is the mophead or hortensia hydrangea, which has a mass of coloured sterile florets that form a round head. The true hydrangea flowers are seen clearly in the other bloom type – the lacecap. These have a cluster of small, fertile flowers in the centre surrounded by a ring of large, coloured, sterile florets. These hydrangeas grow very happily in dappled shade, especially in a spot that gets plenty of afternoon shade. Mopheads even grow and flower in places that receive little sunlight, although the shadier the spot, the fewer the flower heads. While they also grow perfectly in full sun, flower heads rapidly become bleached and colourless if exposed to continuous, strong sunlight. 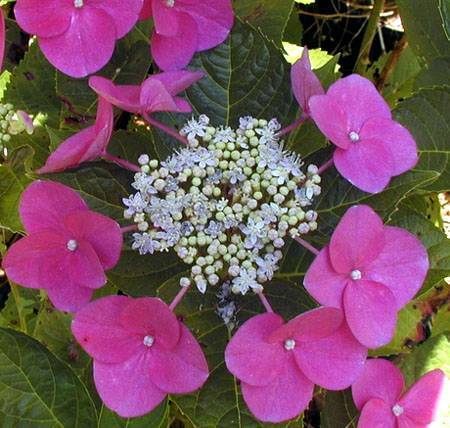 Macrophylla flowers can be pink or blue depending on the acidity or alkalinity of the soil. Acidic soils produce blue flowers, neutral soils produce very pale cream florets, and alkaline soils result in pink or purple. Intensify blue tones by applying a soil acidifier such as aluminum sulphate. Where the conditions are acidic, but pink flowers are desired, sprinkle a double handful of hydrated (builders’) lime around each bush in autumn. The flower heads will turn pink, usually the following growing season. Results are most effective when plants are grown in large pots. Feeding these plants is easy as they are not demanding. Feed them with a slow release fertilizer in spring and late summer, or feed them with a water soluble fertilizer every week from when they start sprouting until they finish blooming. For pink flowers use a fertilizer with high levels of phosphorus, and for blue flowers use a fertilizer low in phosphorus and high in potassium. 1. 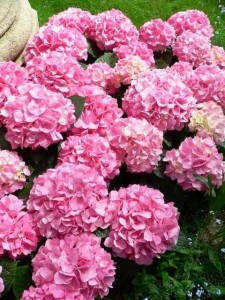 Take cuttings of about 10-15cm long from a branch of the hydrangea shrub in late summer (Then they will be ready to plant out the following spring and will soon be producing flowers). The cuttings will work best if taken from a new branch that did not flower this year. 2. Remove the lower leaves of the bottom two leaf nodes. 4. Dip cuttings in rooting hormone (this is entirely optional) and insert into damp vermiculite, coarse sand or other sterile medium. 5. Water pot well and allow to drain. Make sure soil is moist, but not soggy. Cover cuttings and pot with plastic. Try to keep plastic from touching leaves by adding stakes. Place cuttings in a bright, shady area (NOT in the sun), and do not water again until top of soil begins to feel slightly dry. Overwatering will cause cuttings to rot. Cuttings should begin to root in 1-3 weeks. Macrophylla hydrangeas do not have to be pruned back unless they are very old. Removing dead stems and dead blooms is the only pruning that must be done for the health of the plant, and this can be done at any time. But if your hydrangea is getting much too large (or old), it is best pruned in late summer/early autumn when it has stopped blooming and before the buds for next season´s flowers are produced. If the branches are pruned too late, next summer’s flowering will either be delayed or fail to occur. However, there exists a small group of mophead hydrangeas called “Endless summer” that will bloom no matter when they are pruned. Hydrangeas purchased from a garden center have been growing outdoors in a pot. They can be planted at any time of the year. 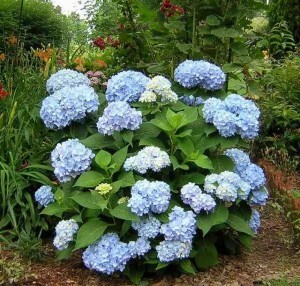 It is wise to purchase a hydrangea while it is blooming. It is usually impossible for the nursery to tell a lacecap from a mophead unless it is blooming, and plants get mislabeled quite often. The best time to transplant hydrangeas is when they are dormant, i.e. after most of the leaves have fallen off the hydrangeas. Do not plant a hydrangea during the hottest part of the summer unless it cannot be helped. If it must be done, be on hand to give it some TLC and to keep it well watered. Hydrangeas are moderately toxic if eaten, however, poisoning is rare, as the plant does not look like an enticing food source. Gardening in harmony with a Mediterranean climate means taking advantage of winter rain and allowing the garden to rest over hot summers. In this beautifully illustrated, practical handbook, Heidi Gildemeister provides both novice and experienced gardeners with a comprehensive guide for waterwise gardening, with over one thousand drought-tolerant Mediterranean plants chosen both for their beauty and for their easygoing ways. Well indexed with common and botanical names, “Mediterranean Gardening” will be indispensable not only for gardeners in California, the Mediterranean basin, and Mediterranean climate areas in South America, Australia, and Africa, but for anyone living in a region that experiences drought. Gildemeister explains how drought-tolerant plants that are suitably matched with a site and carefully planted and mulched can live on winter rain and, once established, do not need additional summer water – as in nature. The Plant Selection lists over one thousand plants from nearly five hundred genera, including their preferred growing conditions, propagation, best use, and maintenance. Guidelines in eight steps describe the planning of waterwise gardens, such as for the establishment of dappled shade to conserve precious soil moisture. Successful alternatives to the water-intensive lawn offer attractive design ideas. “Mediterranean Gardening” offers a wealth of information: ‘easy’ plants for the beginner, new choices for the garden architect, and for botanists the latest findings on minimum temperatures plants can endure. An extensive bibliography covering drought tolerance and a list of useful addresses make this book as helpful to people converting to water-, labor-, and ecology-conscious gardening as to those starting from scratch. Gardening in Spain Hydrangeas flowering star of the summer and autumn garden. Spain Info Hydrangea San Francisco De Asis, Urb Marina, San Fulgencio, 03177, Alicante, Spain. 38n21, 0w29.